This entry was posted in Burano, Italy, Travel and tagged clothesline, postcards. Bookmark the permalink. As kid I loved to watch the clothes blow in the wind and smell the freshness of sun-dried clothes… Then I would hear my mom yelling out the window, “Get from under the clothes!”. Fun times! :) Thanks for the memories! Burano is just the place for people who like clotheslines! Thanks. I love that the houses in Burano are so colorful, too! I like the different coloured yet well matched hues of the houses. They really are color coordinated, whether or not it was done intentionally! I love everything about this photo. The color of the houses, the flowers in the pots, the strips on the doors, the tiles on the top of the buildings and the angle of the shot. All indeed makes for a wonderful postcard. Thanks for posting. I agree with you! It seemed to me very cheerful and lively, and I remember there actually was a slight breeze. Good observations! Love the colours. And it looks so clean! Aren’t the colors lovely? And you’re right, the island was spotlessly clean! Beautiful:) Have a Great Weekend! Burano was one of my favourite places when I visited Venice and I really like clothes lines as photo opportunities! I’d love to visit here. Just as you say, it looks picture postcard perfect. I would highly recommend a visit there. It’s very charming and beautiful! This photo just oozes with charm! Love it! You have captured Burano perfectly, such a lovely, colourful place to visit and the laundry hanging from buildings reminds you that you’re visiting someone’s home and not just a tourist destination. That’s the thing that I remember most – this lovely place is where people live and do everyday things like washing and drying clothes. I’m so glad that you saw that, too! Beautiful colors on those buildings; love it. 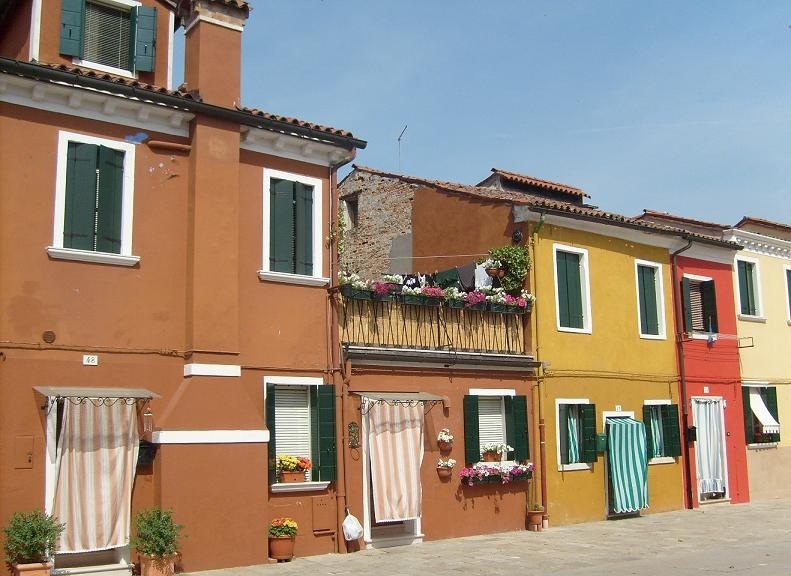 Again,you give us a glimpse into daily living in Italy, Burano this time. Thanks! That is one *verrrrry* inviting scene! Lovely shot. Thank you. I thought it looked cheerful and inviting, too! Thank you. I thought that Burano was very photogenic! Loved Burano and Murano! The buildings and the architecture and the water and put it all together and it’s beautiful! Burano is such a beautiful, photogenic place, isn’t it?